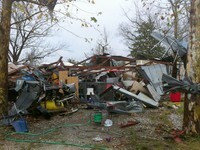 Notasulga, AL has been hit by tornados in recent years. This page contains information and links about those disasters. Williams Chapel (Little Texas) came on Nov. 21st to clear debris and stayed all day working. Also, immediately after the storm, one resident spoke highly of how Mayor Tew and the Notasulga town officials, the Macon County Commission and Chairman Maxwell, Notasulga Police, Macon County Sheriff Department, Macon County Emergency Office and others all came to their aid, working together and really helping in the time of need. She said she was truly thankful to them all. Notasulga, AL (WSFA) - The National Weather Service survey team is confirming that an EF-2 tornado with maximum winds of 120 mph hit Notasulga Thursday evening. The report is still being compiled, but officials say the tornado touched down at approximately 8:42 p.m. and stayed on the ground for 5.1 miles. The tornado's path was approximately 200 yards wide. The tornado's strongest point came as it passed near the intersection of Hwy. 14 and Macon County Road 39 where a large home was heavily damaged. This link has the history of tornados in or near Notasulga, Alabama since 1950.